Once upon a time, there was a god. 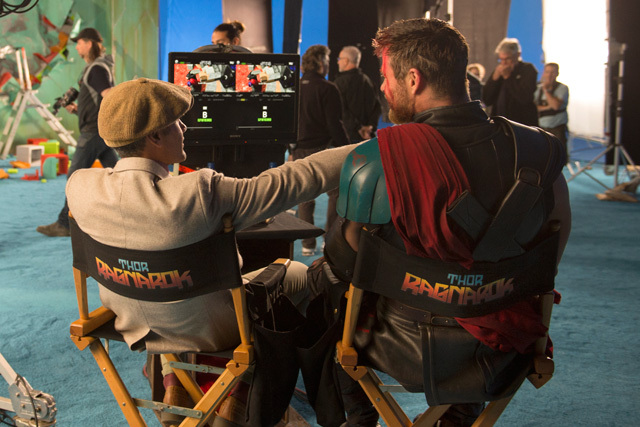 It was more than seven years ago that ComingSoon.net paid a visit to the set of Marvel Studios‘ Thor. At the time, the Marvel Cinematic universe was nearly two years old, but had produced only two features: Iron Man and The Incredible Hulk. With the Mighty Thor the next Marvel character to get the big screen treatment, there was serious debate among fans as to how any movie could possibly get it right, let alone one that would bring gods into the big screen canon. It was on that visit to Asgard (which you can read about here) that the MCU truly began to expand with an exponential momentum that has led us here. Seven years later, so much has changed for Marvel Studios and a massive, cosmically-charged franchise now faces the coming of Ragnarok and, perhaps, a twilight for their gods. 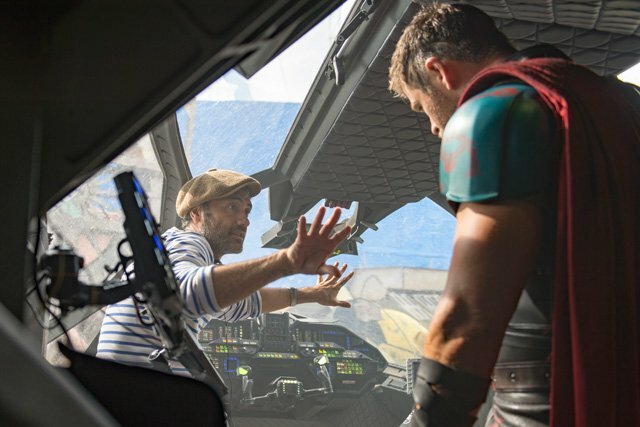 “I liken the filmmaking process to going into battle,” deadpans director Taika Waititi, clutching an enormous battle axe on the Australian set of Thor: Ragnarok. Much of the day has seen a battle sequence involving Thor, Loki, the Hulk and two new characters that comic book fans know very well, the Asgardian warrior Valkyrie (Tessa Thompson) and Ragnarok’s big bad, Hela (Cate Blanchett). Waititi’s big-screen credits include the vampire mockumentary What We Do in the Shadows, the coming-of-age drama Boy and, most recently, the comedy adventure Hunt for the Wilderpeople. Thor has been missing in action for some time when Ragnarok begins. Outside of a non-canon short, audiences last saw Chris Hemsworth’s Thor in 2015’s Avengers: Age of Ultron. It was visions of the fall of Asgard that deeply troubled Thor, sending him on a quest to try and prevent the tragedy from occurring. Meanwhile, the end of Thor: The Dark World saw Tom Hiddleston’s Loki secretly take the throne. Unfortunately for the trickster, Asgard now has challenges to face without the true might of Odin. How that leads to Loki and Thor teaming up to head to Earth remains to be seen, but we know from the Doctor Strange post-credit sequence that they eventually wind up on Earth in need of the services of Benedict Cumberbatch’s clever sorcerer. 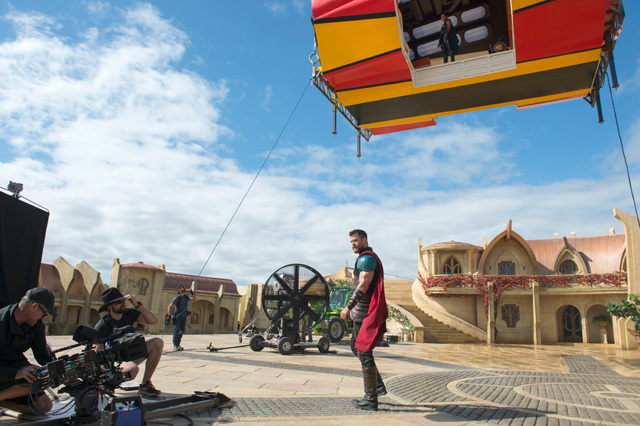 Massive outdoor sets were constructed for Ragnarok that showcase Asgardian civilian life. Because most of what we’ve seen from the planet to date are throne rooms and extravagant palaces, the new film will make an effort to expand Asgardian culture. To that end, a massive outdoor marketplace was built, equipped even with a functional river running through it. Several ginormous outdoor sets later, things get even more exciting. While Thor: Ragnarok obviously borrows some story details from the 2006 Planet Hulk comics, don’t expect a faithful adaptation of that storyline in any way. While the planet in the film has the same name, Sakaar, it’s actually a massive Jack Kirby world! As hinted in the trailer, the entirety of the planet is based on the colorful artwork of Marvel’s original King, who this year would be celebrating his 100th birthday. Some of Sakaar’s paneling even has its own Kirby Krackle! As it turns out, Sakaar isn’t even really a planet so much as it is a junkyard. There are plenty of wormholes in the MCU and sometimes things don’t wind up coming out where they’re supposed to. Everything that gets lost winds up getting spit out at the same place. 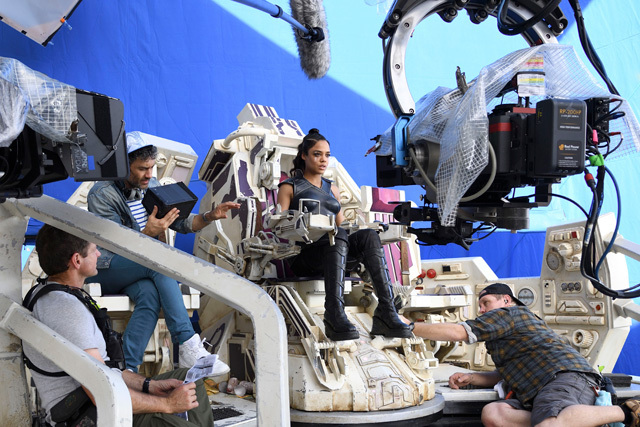 From bits of junk to entire spaceships (maybe even a really familiar spaceship), Sakaar has grown into a thriving artificial world populated by visitors to Sakaar’s gladiatorial matches. The reigning champ for some time now is very large and very green. Although Mark Ruffalo wasn’t on set during our visit, we did learn that Bruce Banner has been in his Hulk form for some time — maybe even as far back as the last time we saw him in Age of Ultron. It wasn’t revealed what brought him to Sakaar, but ever since he arrived, he’s been in Hulk mode, fighting in the “conquest of champions” set up by Jeff Goldblum’s Grandmaster. 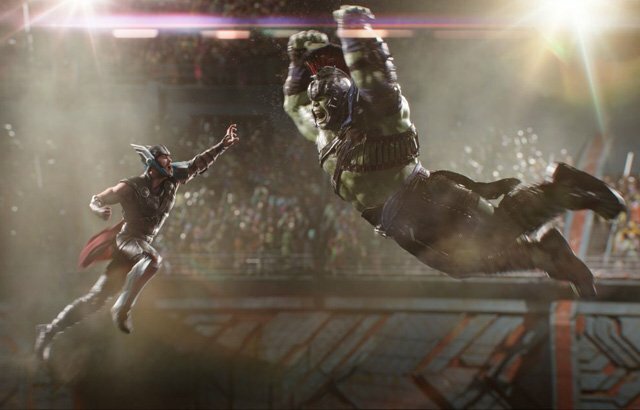 Not only does the Hulk battling Thor offer some exciting cinematic spectacle, the gladiatorial arena helps explore a new side of Thor. Sakaar also brings Thor face to face with an interesting figure from Asgard’s past in Tessa Thompson’s Valkyrie. Valkyrie was a bit of a celebrity to Thor and he’s a big fan of hers. Valkyrie is said to have two distinct costumes in the movie, but they are inspired by different iterations of the comic book character. If you didn’t already love Tessa Thompson, just listen to her sympathize with anyone who feels she isn’t the right actress to play the character. It’s unclear where and when Valkyrie will show up again, but it’s quite possible that she’ll be a player in next summer’s Avengers: Infinity War. Whatever follows Ragnarok, though, Taika Waititi promises that the November 3 release will be both self contained and part of a larger whole. Thor: Ragnarok hits theaters in 2D, 3D and IMAX on November 3. Advance tickets are now on sale wherever tickets are sold.